At Origin Hunters we are passionate about genetic genealogy and family research. 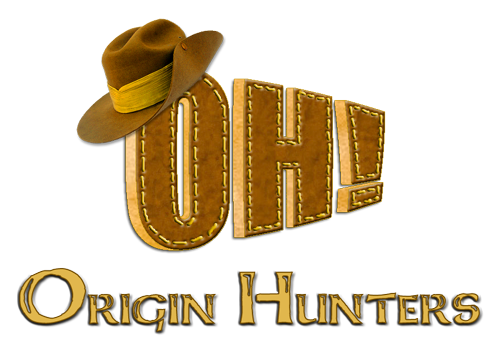 Every ancestor hunt is exciting. Every day we ask - "Where did you come from?" If we were to look at the Y-DNA family tree, we would see ancestors and descendants in a genetic sense. Haplogroup B is descended from A and C is descended from B. If we keep going, R is descended from P, etc. Within haplogroup R is SNP R-L11/P310 (R1b1a2a1a ISOGG 2014). There was a boy born somewhere between 3,000 and 10,000 years ago (there is much disagreement on the exact age). This boy was the first male to have this mutation on his Y-chromosome. He essentially became the ‘father’ of all R1b men in Western Europe. This R-L11 man had three sons, in the genetic sense, not in the literal sense. The first two sons are R-U106 and R-P312. 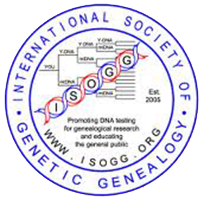 Their stories are well known (at least in genetic genealogy circles). This is the story of the third brother, the one without a name. I’m going out on a limb in saying that this third branch exists as an independent unidentified SNP. R-DF100 has been identified as belonging to this third branch. Yet, it is too early to determine whether DF100 is the third brother or one of the many nephews (I had to keep the analogy going). Currently it is known as R-L11*/P310* (xU106,xP312), which means that folks on this branch test positive for having the L11 SNP and test negative for the U106 and P312 SNPs. Let’s call him R-x for simplicity. In case you were wondering, a SNP (single nucleotide polymorphism) is a mutation that can mark a branch point on your DNA. What do we know about R-x? They are a small group, only about 10% of the very large R1b population in Europe. They are still found in substantial numbers in Danelaw areas, the Netherlands, Pomerania, former Prussia and Denmark. U.S. President John Adams is one famous member of group R-x. A group of R-x descendants have created a site (http://www.worldfamilies.net/surnames/r1b1a2a1a) for those who are interested in tracing their family origins further back, have taken a y-DNA deep clade test and tested positive for L11 and negative for P312 / U106. I was approached because of my work done on William the Conqueror’s DNA. The question was asked, what was the frequency of R-L11* (R-x) in the Conqueror study. All of the DNA records that made it into the final paper were R-L21*, which is downstream from R-P312. Unfortunately, for the R-x folks, that meant that no R-x records made it into the William the Conqueror modal haplotype. R-x was rare and it piqued my curiosity. I wanted to know how they fit into the bigger picture, where they came from and maybe connect them to a part of history. I’ve had some good success with geographical distribution of y-DNA data based on multiple distance measurements from reference positions (BGM). To start, I collected 26 R-x y-DNA records with close STR marker matches and known or probable SNP matches. Eight of these records were directly from the R1b1a2a1a website group data. The records were processed to determine time to most recent common ancestor (TMRCA). The neighbor-joining method was run on the results to create a phylogenetic tree. Each of these records were picked because they also contained self-reported ancestral origins. The records were mapped based on these origins and a range calculated from the TMRCA was drawn as a radius representing distance to a common ancestor. See “Getting More” for additional details. Migration direction is determined from phylogenetic connections. The orange arrows represent the primary migrations from the South Baltic region starting 2,000 years ago ± 200 years. The destinations for these migrations were into Scandinavia and along the Rhine River. 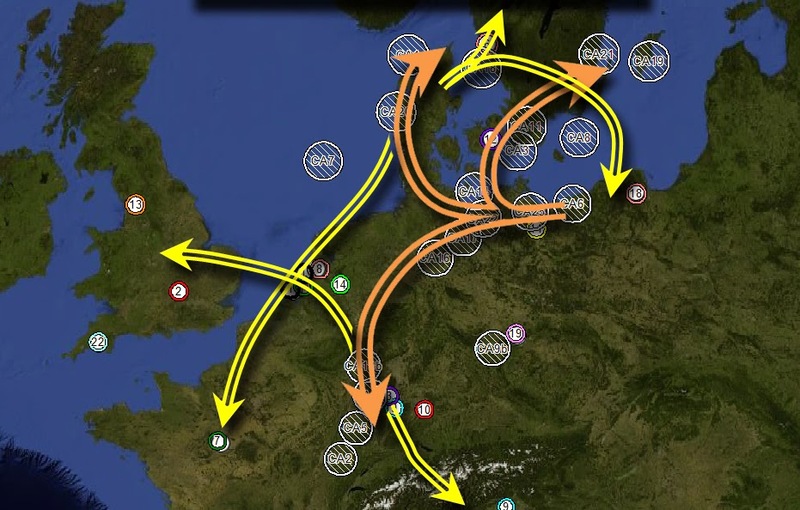 The yellow arrows represent secondary migration events ending about 1,000 years ago. The results validate the R-x group’s origin locations (Pomerania, former Prussia and Denmark) and adds the Rhine River as a secondary origin. This is not the endgame. This just gets us 2,000 years into the past. Additional records need to be identified to push us back another 1,000 or so years. Where were the R-x ancestors before they were in the South Baltic? The third brother remains unnamed. Perhaps his name is R-DF100. The SNP hunters, those folks that are finding new SNPs every day, need more R-L11*/P310* (xU106,xP312) samples in order to identify a defining SNP. I’d also love to see better techniques of determining the age of a genetic branch. Someday we will know the name and the birthdate of the third brother. Michael, Thankyou very much for your excellent work. You have done much to give us legitimacy for our own long efforts to come out of the mists as to who we are and where from. It is highly rewarding to know your work validates much if not most of ours. Your work is a new milestone in our progress. Thank you very much for your hard work Michael! It is wonderful to receive recognition as a lineage distinct from mainstream European genetics. Anyone reading this post and wondering if this applies to you, please take a Ydna test or Geno 2.0 and come join our clade. My Carrow line is L11,P310,P311,L52 at 23andme and is M-269 at FTDNA.. Can I assume that is us or do I need to try to test M106 and P312. A basic SNP test is done to verify haplogroup, but L11/P310 may not be the terminal SNP. The Geno 2.0 or the new Big Y tests will give you a terminal SNP. You can test for U106 or P312 specifically, but most likely you will have to test again. So probably I need to wait for the new terminal SNP? I NOW see that it is my Carrow line as well as my Rementer (Alsace? Mainz?) 5th great great.. So that indicates we wait for a SNP? Thanks so much Mike!! I administer the Rementer as well as Carrow,Dugan,Faunt and Lower Delmarva groups.. a lot but this is quite exciting for me.. Excellent site with regards to both information and presentation. Great job!!! - how do you calculate the +-200 years in this study? - do you use a probability of 95% with the FTDNA mutant rate? I use both the 50% and the 95% probability to create a range. For this study, that gave a 400 year difference (or +-200). Thank you so much for your quick answer. It is clearer for me now. I consider your technique to be very interesting (I have read your pdfs and watched your youtube videos) and it could give interesting results. When you are looking for the biogeographical multilateration, you consider both probabiities, the average of both or just one (50 or 95%)? Sorry if I'm asking too much. I only use the 95% FTDNA rate for multilateration. It had the best correlation to nomadic migration rate of 25 to 30 km per generation. I get it. Thank you for your time and your interesting technique. I'll keep reading your blog and your youtube channel to know how far this can be developed. Hello Michael, Just got results back from a Geno 2.0 for my mother's brother which indicated he was R-P310 (no *). This became R-L11 (no *) when I transferred the results to FTDNA. My mothers family can be traced back to the Thomas Mattingly of Maryland who emigrated from Hampshire County, England (possibly the village of Mattingly) around 1663. 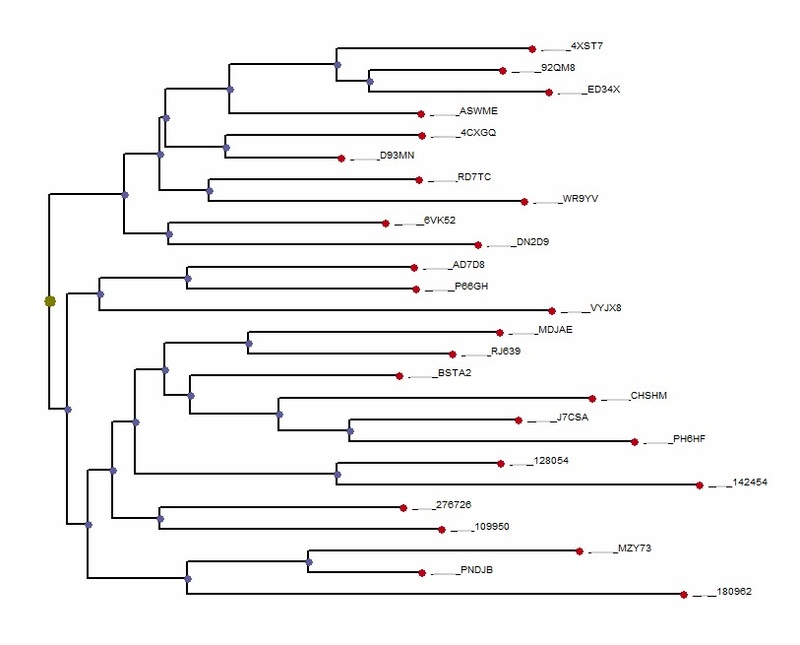 I see a significant number of branches to the R-P310/L11 tree downstream. Any thoughts on whether Big-Y or separate SNP testing is best to determine the terminal SNP? 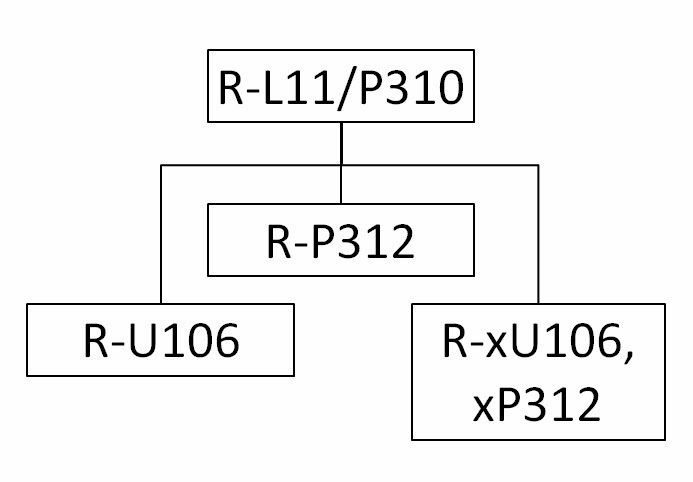 R-P310 and R-L11 are essentially the same SNP discovered at different labs. Geno 2.0 would have tested positive for R-U106 or R-P312 or something downstream of those SNPs if it was there. The raw data from Geno 2.0 would show those SNPs as negative. It is probable that your uncle is related to the 'Third Brother' (R-CTS4528 & DF100). The Big Y is on sale right now ($595) or you could test for R-CTS4528 & R-DF100 @ $39 each. To test individual SNPs, you may need to start with an FTDNA Y-DNA 37 marker STR kit ($169). The Big Y would definitely give you the terminal SNP answer. The Y-DNA STR test would help match other Mattingly men. I can't guarantee that the R-CTS4528 & DF100 tests would come back positive and then you would be still searching for your SNP. Is the third brother P311? As I see 310, and 312 listed. This is a welcome call to join our facebook group to anyone who thinks they are DF100-CTS4528 or who have done a Natgeo Genome2 test and are U106- but not shown as P312+ or a member of any P312 sub-clade. Michael has done many interesting and highly informative reports. WE endorse his work and diagrams re our new 3rd Clade. Doug Marker - admin DF100-CTS45128 project. I can't get any lower in my R-Z307 line but I have both L11 and P310. L11 is my last + marker. Yes I am interested in a 311 project. Any guidance would be appreciated. Just did a test with Nat Geo Geno 2.0 and as it turns out they place me in R-P310 (U106-, P312-, and CTS4528-). My father had done work with ftDNA in the hopes of determining if his relatives were really from Germany, as family tradition said. Traditional methods only got us to Philadlelphia PA around the 1780s. The STR test gave Dad a match with a Myers whose oldest relative was in the US in the early 19th century. So, reading the above is heartening. I believe we have a better chance of finding out our origins now, but looking at the latest YFull, and talking with as many people as I can, is it reasonable to seek further genetic studies that might disambiguate R-L151 from R-L151* and R-A8051? Or is the CTS4528- area too new to seek further testing? Based on the current Y-DNA tree, R-A8051 would be considered a 4th brother in my above scenario. It is very new and additional testing at this time would not provide more detail. If you'd like to send me the STR kit #, I could look for more info. 52 ANCESTORS IN 52 WEEKS 2019 WEEK 16 :LUKE PERKINS JR OF PLYMPTON, MA.